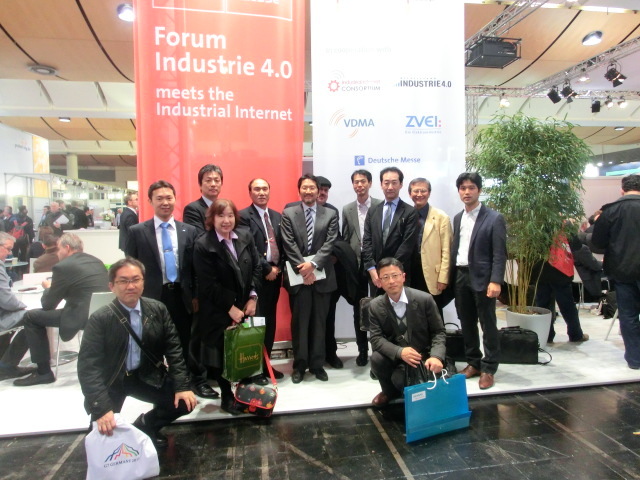 The Hannover Messe, also known as the Hanover Fair, is said to be the world’s largest industry fair, as many cutting-edge industrial technologies and products are presented at the event. This year’s fair was held at the Hanover Fairground in Germany on April 25 (Monday) to 29 (Friday), 2016, reportedly drawing 190,000 people from across the world. Prof. Dr. Yasuyuki Nishioka, president of the IVI, delivered a speech titled “Industrial Value Chain Initiative (IVI) – A Japanese contribution to smart manufacturing” during the “Industrie 4.0 meets the Industrial Internet” program at the Hannover Messe 2016. 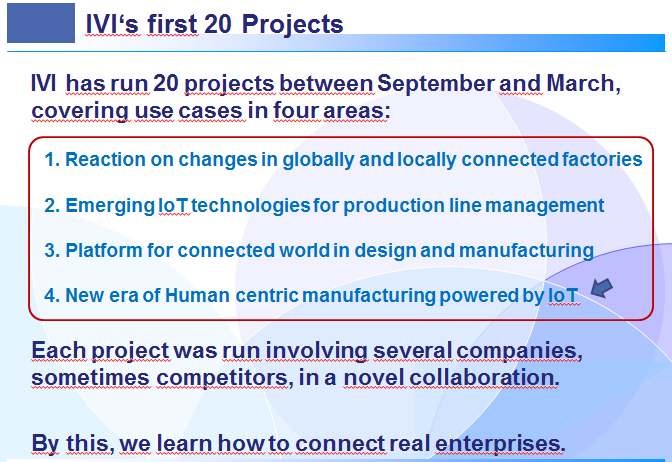 In the speech, Prof. Dr. Nishioka introduced the IVI’s 20 business scenario projects as the achievement of our fiscal 2015 activities, and explained that the IVI will proceed with various programs, putting more emphasis on the value creation based on humans’ knowledge and the separation between competitive and cooperative fields, compared with projects of Germany and the United States. 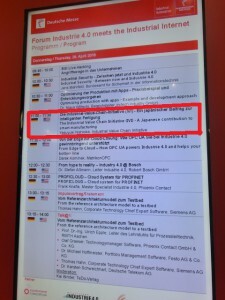 Although the speech was given at an open space on the site of the Hannover Messe, the venue was filled to capacity, indicating that the session drew a high degree of attention even in Germany. Prof. Dr. Nishioka exchanged business cards with many attendees. We believe that session marked the first step in our publicity campaigns overseas. 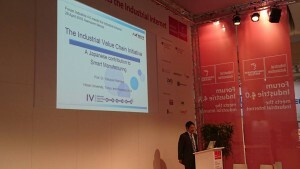 Prof. Dr. Yasuyuki Nishioka, president of the IVI, delivers a speech. 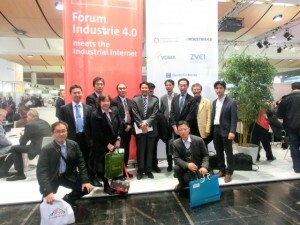 Prof. Dr. Yasuyuki Nishioka, president of the IVI, poses for a photo with other IVI members. Prof. Dr. Henning Kagermann is currently the president of the German National Academy of Science and Engineering (Acatech), which presents proposals from a technical perspective to overcome future challenges, and used to serve as chairman and CEO of SAP. 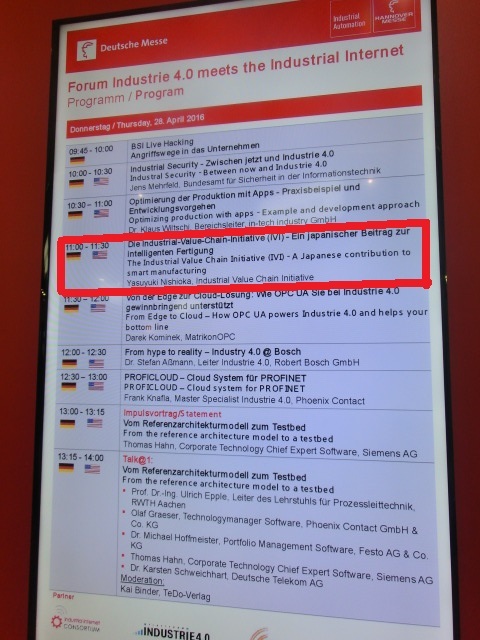 The campaign of Germany’s Industrie 4.0, also known as Industry 4.0 in English, was initiated after Prof. Dr. Kagermann and two other officials released the “declaration of the fourth industrial revolution” in 2011. 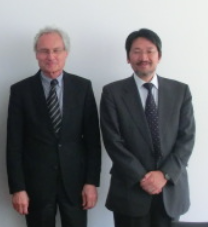 IVI President Yasuyuki Nishioka met with Prof. Dr. Kagermann in Berlin on May 3 and briefed him on the IVI’s activities in Japan. At the meeting, Prof. Dr. Kagermann vowed to put Prof. Dr. Nishioka in touch with a person who would help promote cooperation between Japan and Germany. At the IoT Business Platform Asia conference held in Manila. The IVI’s Publicity Committee introduced IVI activities on behalf of the IVI on May 23. 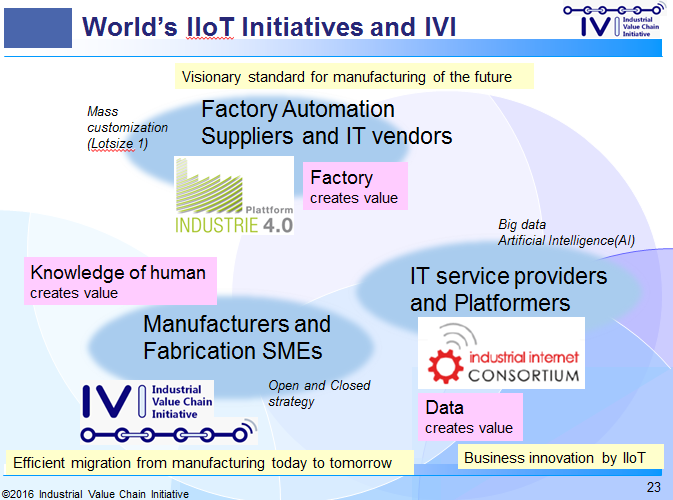 A speech title is “Industrial Value Chain Initiative (IVI) – Japan’s initiative to drive digital technology in manufacturing”. It marked the first IVI speech in Asian states other than Japan. Hatsuko Kouroku, Evangelist of the IVI, delivers a speech. A public symposium will be held on June 17 to coincide with the general meeting to mark the establishment of the planned corporation. At the symposium, a keynote address will be delivered by an official of the Ministry of Economy, Trade and Industry and business scenario working groups (WG) will be commended for their fiscal 2015 activities. The IVI’s programs planned in fiscal 2016 will also be presented at the symposium. 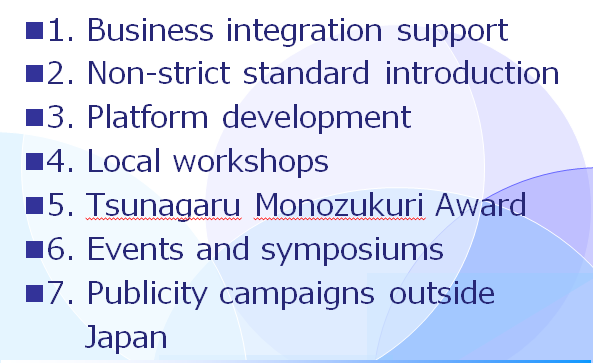 The Tsunagaru Monozukuri Award 2016 will choose and commend WG that showed excellent or good performances during fiscal 2015 from all the 20 business scenario WG. The initial screening will be conducted by the IVI president and the Business Integration Committee, while the second-stage screening is to be carried out by the advisory and commendation committee, headed by Mr. Koichi Ogawa. IVI President Yasuyuki Nishioka announced how business scenario WG should proceed with their activities this fiscal year. The preparatory phase has already begun, where new WG should be formed to start their yearlong activity. 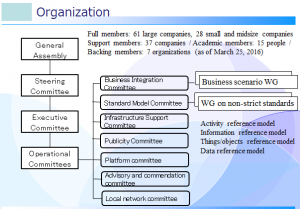 After the June 9 (Thursday) session, detailed activities of each business scenario WG will be finalized. To continuously promote various activities in fiscal 2016, the IVI has established the platform committee, the advisory and commendation committee and the local network committee so that we can more efficiently manage the organization. It is an open event – also non-IVI members are welcome to attend the symposium. We recommend you do not miss this great opportunity. We look forward to seeing you at the symposium! And if you can’t come, you still can find some information on this website after the event. 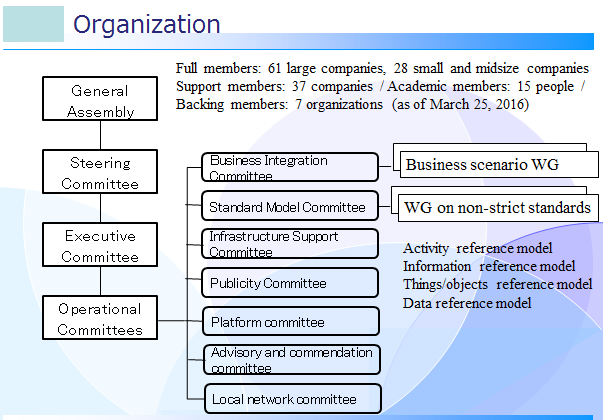 The organizational structure of the IVI is changed for fiscal 2016. The fourth edition of the IVI Newsletter focuses on the IVI’s activities in Germany and other publicity campaigns in overseas countries. 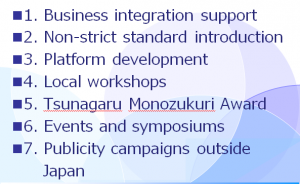 In fiscal 2016, we will further promote efforts to make more people outside Japan aware of IVI activities. Now is the time when the IVI’s new adventure begins. The next newsletter is to detail the public symposium. 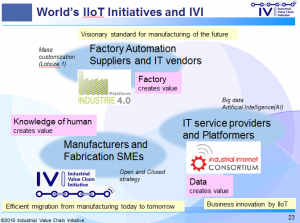 Public review draft of Manufacturing open framework for IVI ecosystem. 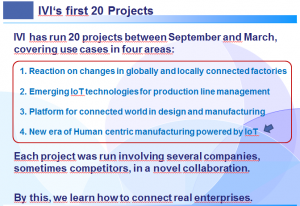 The 2nd IIC & IVI joint use cases sharing seminar was held. 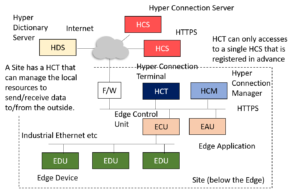 © 2019 Industrial Valuechain Initiative.